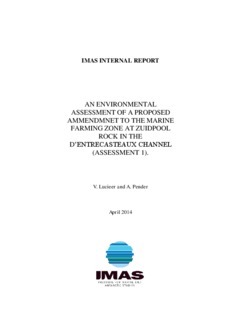 An environmental assessment of a proposed marine farming zone extension at Zuidpool Rock, in the D’Entrecasteaux Channel, was conducted in February 2014. This assessment is comprised of two parts, encompassing Zuidpool Rock northern and southern sites and have been distinguished as Assessments 1 and 2, with the results being presented in two separate reports. This report addresses Assessment 1. The site covered 2.76 km2 (276 ha) and was orientated in a north westerly direction. The benthic habitats within the zone assessment area comprised of silt (60.7%) and silty sand (39.3%). Environmental data on substrate type, habitat distribution, bathymetry, and benthic flora and fauna were assessed. Within the proposed zone the substrate was characterized by silt and silty sand. The bathymetry ranged from 23 m to 54 m and was characterized by a deep channel to 54 m in the south west of the site which was flanked by two shallower banks, indicative of a drowned river valley. The silty sand substrate was brown to grey brown in colour with shell grit, evidence of active bioturbation; live and dead New Zealand screwshells (Maoriculpus roseus), brittle stars, squat lobsters (Munida haswelli) and polychaete worms were common across the whole site.